A best-selling, autobiographical depiction of class privilege, bad romance, and political intrigue during World War II in China. Now available in English for the first time, Eileen Chang’s dark romance opens with Julie, living at a convent school in Hong Kong on the eve of the Japanese invasion. Her mother, Rachel, long divorced from Julie’s opium-addict father, saunters around the world with various lovers. Recollections of Julie’s horrifying but privileged childhood in Shanghai clash with a flamboyant, sometimes incestuous cast of relations that crowd her life. Eventually, back in Shanghai, she meets the magnetic Chih-yung, a traitor who collaborates with the Japanese puppet regime. Soon they’re in the throes of an impassioned love affair that swings back and forth between ardor and anxiety, secrecy and ruin. Like Julie’s relationship with her mother, her marriage to Chih-yung is marked by long stretches of separation interspersed with unexpected little reunions. 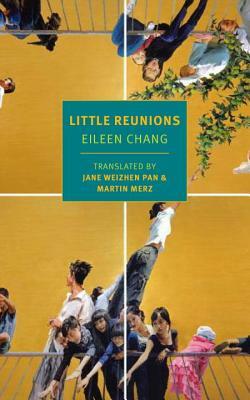 Chang’s emotionally fraught, bitterly humorous novel holds a fractured mirror directly in front of her own heart. locked her in her room for nearly half a year. Chang studied literature at the University of Hong Kong, but the Japanese attack on the city in 1941 forced her to return to occupied Shanghai, where she was able to publish the stories and essays (collected in two volumes, Romances, 1944, and Written on Water, 1945) that soon made her a literary star. In 1944 Chang married Hu Lancheng, a Japanese sympathizer whose sexual infidelities led to their divorce three years later. The rise of Communist influence made it increasingly difficult for Chang to continue living in Shanghai; she moved to Hong Kong in 1952, then immigrated to the United States three years later. She remarried (an American, Ferdinand Reyher, who died in 1967) and held various posts as a writer in residence; in 1969 she obtained a more permanent position as a researcher at Berkeley. Two novels, both commissioned in the 1950s by the United States Information Service as anti-Communist propaganda, The Rice Sprout Song and Naked Earth (the latter now available as an NYRB Classic), were followed by a third, The Rouge of the North (1967), which expanded on her celebrated early novella “The Golden Cangue.” Chang continued writing essays and stories in Chinese as well scripts for Hong Kong films, and began work on an English translation of the famous Qing novel The Sing-Song Girls of Shanghai. In spite of the tremendous revival of interest in her work that began in Taiwan and Hong Kong in the 1970s, and that later spread to mainland China, Chang became ever more reclusive as she grew older. Eileen Chang was found dead in her Los Angeles apartment in September 1995. In 2006, NYRB Classics published Love in a Fallen City, an original collection of her short fiction. The following year, Lust, Caution, a film adaptation of Chang’s 1979 novella, directed by Ang Lee, was released. Jane Weizhen Pan has collaborated with Martin Merz on translations of many works by contemporary Chinese writers. She first encountered Eileen Chang’s work as a high-school student in China and has been a devoted reader of her writing since. She is based in Melbourne, Australia, where her research focuses on early Chinese translations of English classics. Martin Merz studied Chinese at Melbourne University and later received an MA in applied translation in Hong Kong. He moved to Asia in 1980 and has worked in greater China ever since. In addition to his co-translations with Jane Weizhen Pan, he translated the modern Peking opera Mulian Rescues His Mother, which was performed at the Hong Kong Fringe in the early 1990s.